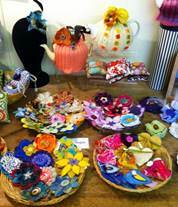 Hand Made textile brooches, necklaces, scarves, bracelets and corsages as well as jewellery, cards and prints in four lovely display rooms and two textile artists’ studios. 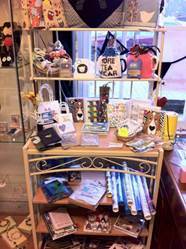 We also have a fine stock of indie wool / yarn, threads, kits and pattern books for those who would like a sewing or crochet project. We also sell gift vouchers. We are open every day except Mondays. From 10am till 5pm. We also have a ‘drop in’ session every Friday afternoon 1pm till 3pm for anyone who would like to just sit, chat and make anything they like.